About 2 months ago, I decided to chop off my almost 10-yr old locks. I haven't had a 'real' haircut since I got married...just trims here and there...mostly done at home either by me or my personal hairdresser aka...the husband! I'm so used in having long hair that it really doesn't matter to me if it takes that long to have a hair cut. But it's not just me now and there's the difference. The first thing that the lady asked me before chopping off my long locks was...do you want to donate your hair to Locks of Love? No question about that...so she cut a foot off [there's a minimum of 10 inches for donating] before doing the much needed hair-[make]-over on me. The lady said that they used to send the hair donations themselves but that's no longer the case so she gave us the hair and asked us to go online for the instructions on how to send in the hair. 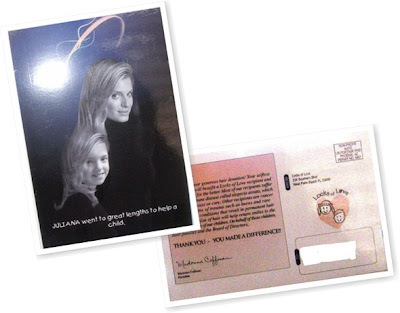 A few weeks ago, I got the above thank you post card from Locks of Love. I'm glad they got the hair and let me know they received it. It will be a while before I can do it again but it feels good to know that the hair I carried around with me for almost 10 years will benefit a little girl who needs it.